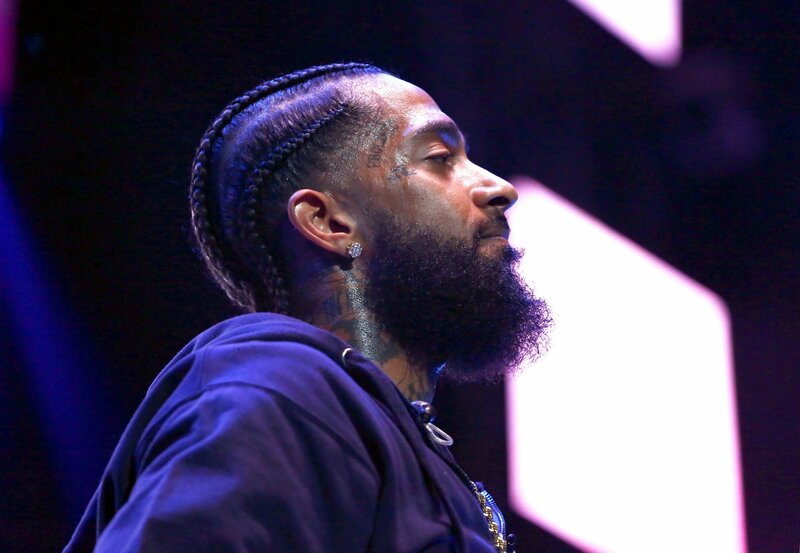 The Los Angeles Police Department has identified a suspect in the murder of rapper Nipsey Hussle, who was shot dead on Sunday. The LAPD tweeted Monday night that 29-year-old Eric Holder is wanted for homicide in the shooting of the Grammy-nominated musician. It urged anyone with information on Holder’s whereabouts to contact the force’s homicide department. Holder was last seen fleeing the scene of the crime in a 2016 white four-door Chevy Cruze CA vehicle with the license plate 7RJD742. The car, which was driven by an unidentified female, had been waiting for Holder in an adjacent alley. Investigators said Monday that Hussle—real name Ermias Asghedom—died from gunshot wounds to his head and torso, the Associated Press reported. Two other men were wounded and remain in hospital. The LAPD said Holder walked up to the three men and fired a barrage of shots as they were standing outside Hussle’s Marathon Clothing Company store on Los Angeles’s Slauson Avenue. The murder scene quickly became a memorial site for the 33-year-old Los Angeles native, who has been lauded for his musical achievements but also his philanthropic projects and community outreach. But on Monday night, a fight broke out at a vigil being held at the scene. According to AP, 300 to 400 people were attending the event when a fight broke out, sparking panic and a stampede as people fled. Fox News 11 was filming the vigil as the violence erupted, and the station’s footage showed mourners clambering over parked cars and walls to safety. At least 19 people were hurt in the melee and taken to hospital for treatment. Two are in critical condition, one having been hit by a car and another having sustained a “penetrating injury.” NBC News quoted anonymous police officials who said one person had been stabbed. Initial reports of gunshots were false, police said, and dozens of officers moved in to clear the crowd. Tributes have been pouring in for Hussle, 33, who had been due to meet with the president of the Los Angeles Board of Police Commissioners and the city’s chief of police to discuss gang violence the day after he was killed. The rapper was committed to investing in his local community and providing business and education opportunities for young, underprivileged entrepreneurs.